_ _You can make these puppies with breakfast, or as a side dish for dinner. This particular batch I paired with meatloaf and because they are baked and not fried, I could pretend I was serving up a healthy meal… Disregard the fact that it was meat wrapped in meat with a side of starch. Everything’s fiiiiine in moderation! 1. Scrub the potato thoroughly and cube into approximately 1/2 to 3/4 inch pieces. 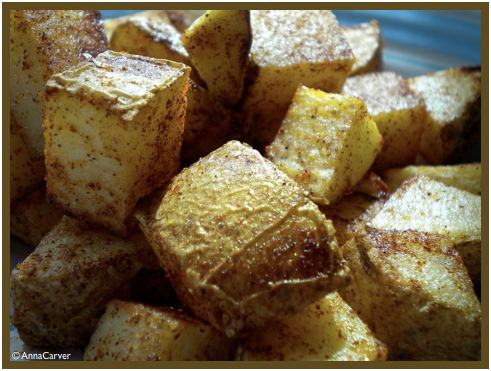 In a large bowl toss the potato cubes with olive oil. 2. In a small bowl mix together all the spices. Sprinkle them over the potatoes, tossing to coat. 3. Spread the potatoes in a single layer on a baking sheet covered in tin foil and lightly coated with cooking spray. 4. Bake for 20 minutes then toss to brown the other side. Bake for another 15-20 minutes until the potatoes are tender and a little crispy.